Why is it that we photographers always feel drawn to shoot the empty chair that’s sitting where it really doesn’t belong? 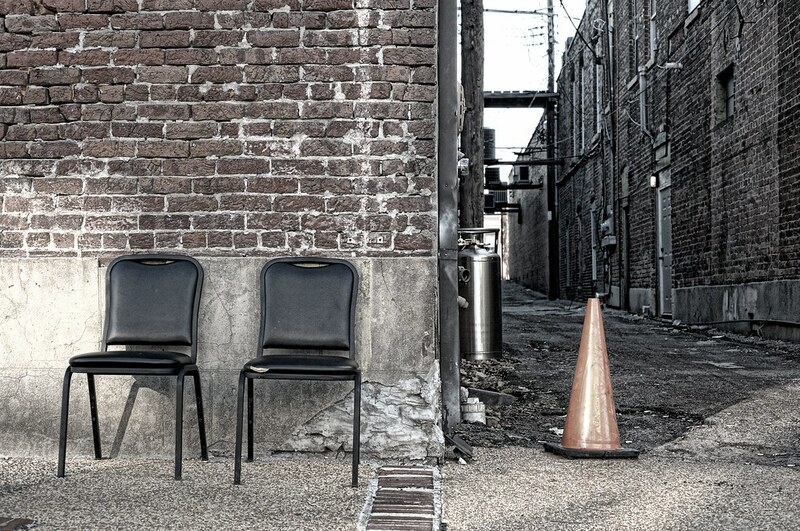 And it was my lucky day, I came across a matching pair of chairs, just sitting out on the sidewalk, next to an orange cone that was warning pedestrians of…..what? Were the chairs dangerous? Was the alley dangerous? Shot with my Nikon D700, 50mm 1.8 Nikkor lens. Processed in Paintshop Photo Pro X4, with Topaz Adjust. This entry was posted in Commentary, Shooting and tagged D700, Mississippi, Nikon, Paint Shop Pro, photography, urbex. Bookmark the permalink. Love it. I grew up in Tupelo… didn’t realize it had so many urbex treasures!